Welcome to the MAD world of computer support. For both small business and home computer users, finding reliable support for your computer problems is time consuming and often expensive. Many local stores will require you to take your computer to their workshops for repair, leaving you without a computer for days, sometimes weeks. 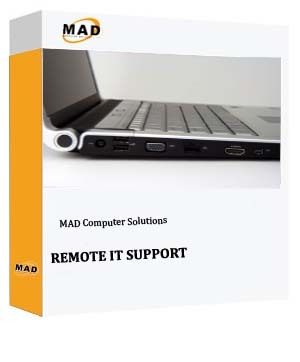 With our Remote computer support subscription MAD computers help you with your everyday PC problems from virus and spyware removal, to friendly help and advice about your IT systems. 90% of computer problems are able to be resolved remotely, with no visit to your home or office required. Telephone our Remote Computer Support helpdesk today on 0843 2893818 to find out how MAD Computer Solutions may help you.